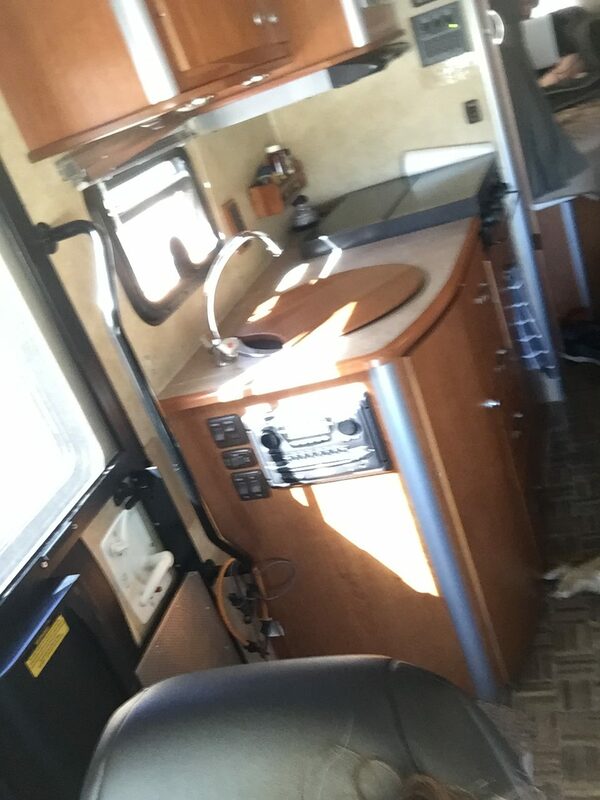 Two weeks ago Ben and I drove to Stanford with an amazing friend in her RV. It may not have been the best way to travel in retrospect, but with what I knew about Stanford (nothing), my anxiety and Ben’s, and our needs it was best at the time. First – my friend was absolutely amazing! She was the patient with a surly, sick teenager, and understanding of his autistic moments and needs. 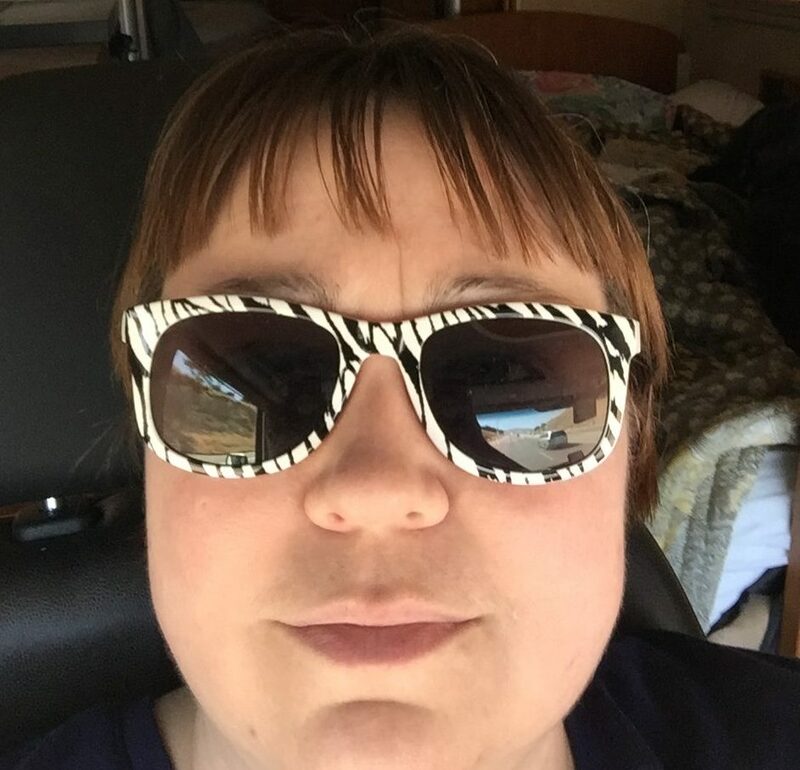 She drove us safely all around the area and was a great support for me as she has endured many of my same illnesses and has had surgery to correct Chiari Malformation. Her service dog, Moby, was calming and distracting for Ben at important times, and an example of how amazing service animals can be. Everyone loved him everywhere we went and his behavior was perfect. I don’t know how to thank her enough! Our Humble Abode, if you look close you can see Ben in the top right corner. time, and they made me feel like they truly wanted to help Ben feel better. Even the anesthesiologist who sedated Ben for his MRI’s was great with him and put him at ease. They were all careful of his feelings and made a point of asking how I was doing in all of this. I would move there tomorrow if I could. Dr. Grant wanted Ben to see a few other specialists to help us rule out other conditions and other options. So the next day we saw Dr. Moreno who is a neurologist at Stanford. he diagnosed Ben with autism (LOL), chronic migraines and possible seizures. Ben has frequent t witches that can cause him to throw a cup or drop his spoon, he also has a tremor that makes him move almost constantly. 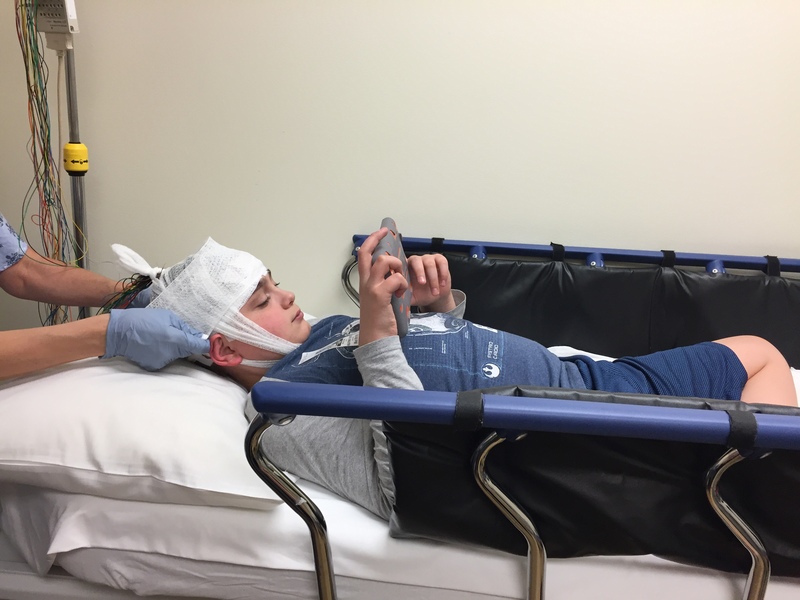 Dr. Moreno had us get an EEG that was thankfully clear and seems to rule out myoclonic seizures, but Ben may still be having seizures that just didn’t show up in that test. Ultimately he wants Ben to have a 24 hour video monitoring EEG, but that has to be scheduled for another time. He gave us several suggestions. Some are lifestyle changes, which we had already implemented. There are supplements he wants Ben to try that include Magnesium Oxide and Vitamin B1. He also started Ben on Depakote for migraines. Depakote runs the risk of causing weight gain, which was a major problem for me, but we’ll see. If that doesn’t work we may try Proponalol (sp?). So far the Depakote seems to be having no effect on Ben’s migraines or pain, but we’ll give it more time. Fortunately it does not seem to be affecting his weight. On October 18th, Ben has an appointment with the pain management department at Stanford. Hopefully they will have more we can do for Ben’s pain. Ben’s symptoms are actually too specific and progressive for what the doctor’s usually see with Chiari, which has led them to believe there is something else going on. He also has signs of a connective tissue disorder and would benefit from seeing a geneticist. Other specialists that he may need to see include a team to rule out POTS as he has issues with fainting and dizziness. However, we took Ben to a cardiologist here in town, and he is familiar with POTS. He put Ben on a heart monitor for a week, during which Ben had multiple episodes of fainting and dizziness. (I watched him black out on our kitchen floor.) The cardiologist called while we were traveling home and told us his heart was fine and to make sure he doesn’t get dehydrated because “that’s what is important in cases like this”. I have no idea what he meant and have not been able to follow-up on that message. So much of this trip was helpful and wonderful but now I am going to vent a little. We are still no closer to finding a solution than we were before we left. We just found doctors more familiar with rare conditions and willing to try things. The trip itself was exhausting and hard. Ben does not like change, and he can be miserable to be around when he is in pain. Many people struggle to understand him or handle his meltdowns and other autistic behaviors. He looks and talks like he should be able to manage things differently, but he just can’t yet. I cannot physically handle long days and nights in weird beds. It’s painful and miserable for me too. Ben has been sick and writhing, crying, and screaming in pain for the last two weeks. We took him to the ER last week and he was diagnosed with a mesenteric gastritis, or intestinal infection/inflammation. He has been downright mean most days. The doctors at Stanford told me that his anger, difficulty doing schoolwork and even behavioral issues are normal based on what he has, and that it is taking all he has to just cope with the illness and pain. I get that, but I still hate being snapped at all day, and cried to over everything. I hate watching him suffer while knowing there is nothing I can do. I hate that he won’t try anything I suggest. I dislike having to parent and teach him while knowing that he cannot handle it. I don’t know if I should just let him watch movies and play on his devices to let him be distracted from the pain, or if I should be pushing him to do more for school and other interests so he continues to learn and develop. At this point he can barely do math, which he has always been exceptional in and can usually do major calculations in his head. Now he struggles to retain multiplication facts. I know that many children with this condition have gone through similar struggles. The pain and high pressure do make it difficult to focus and learn. An “A” student will begin to fail their classes and will return to their previous levels of achievement after surgery. So there lies another question I cannot answer. Do I have him assessed by another surgeon and see if they are more willing to do surgery? I don’t want to push for surgery. I have had it. It is awful! 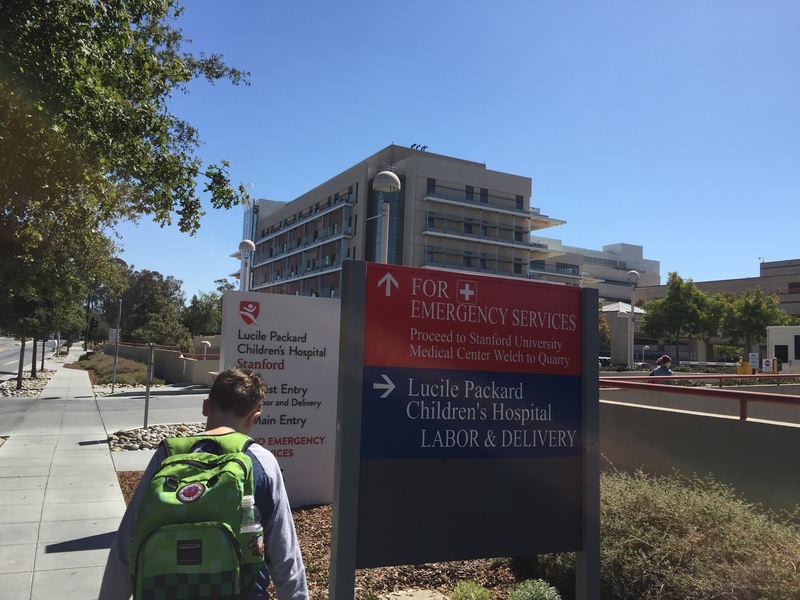 It is the last thing I would want for Ben, and I feel like even though we’ve now gone to Stanford, that it took this long to arrange is evidence of my reluctance to even think about surgery. It makes me physically sick. However, I cannot act like that around Ben, or it will scare him. Chiari is rare. Each surgeon has different criteria for surgery, different surgical approaches, and different opinions about when and why to do surgery. Many don’t know what they are doing and make mistakes that cost patients their health longterm, or even their lives. Seeking out a surgeon who has done multiple surgeries and is familiar with the process is essential, which is why we chose Dr. Grant. There is no pediatric neurosurgeon in Nevada that I would trust to do Ben’s surgery unless it is an emergency. Then there is maybe one. All that aside, Ben is miserable. His quality of life is bad. He barely leaves our home, has almost no friends and spends most of the day in bed. He cries, winces, gasps, and screams in pain. He frequently passes out, gets so dizzy he has to sit down, or feels sick to his stomach. His behavior is hard to manage, he’s basically failing school, and it is a struggle to get him to do basic things like showering, eating, and talking to me nicely. All he wants to do is play video games and watch movies. The video games are losing their ability to distract him, which is concerning because if he is too sick to play games, he usually needs to be checked in the ER. In the grand scheme of things, I would rather Ben failed school and lost himself in video games than force him to cope with this level of pain and illness. I don’t care if he fails high school, or never leaves home if it means less suffering. I also want him to be able to grow up and enjoy life as a capable adult. He was already going to struggle with that because he is autistic, now this is putting is development further and further behind. I have no fears that he will grow up and be able to work and even marry and parent, but it will take longer and it depends upon all this going away. This is me on the trip. I had swollen ankles, and am so tired! So, what is a mother to do? Do I seek a neurosurgeon who will perform a dangerous and difficult surgery with the hope that Ben will see great improvement afterward? Do I fight for better management of his symptoms and hope that is enough? Are we seeking a different mystery illness that we just haven’t identified yet? Do we pray and hope for a miracle? Do I fight Ben and force him to study and work and exercise in the hopes that pushes him through this period in his life with some semblance of normalcy? I think I want him to be as calm and happy as possible. That doesn’t meant video games and screen time all day and night, but it does mean some of that. It means school is in maintenance mode where I am just trying to keep him from losing too much of what he already knows and hope to keep his mind engaged and learning during the better days. It means setting the example when it comes to diet and exercise and other lifestyle changes that may help him, and gently encouraging him to join in. Ultimately I want him better, so I will continue to seek people who can help him. I want him to know he is loved. I want him to have a testimony of the Church of Jesus Christ of Latter Day Saints. I want him to have a personal relationship with his Heavenly Father so he knows where to go for comfort and strength. I want him to have a testimony of the Plan of Salvation so he has hope for the future and he does not fear death. I want to spend time with him in fun and meaningful ways. I want to build memories, and have our home be a peaceful place where he can rest and heal. I want him to find things he loves to do that are preferably not just video games and tv. I want to be at peace. I want my time with my son however long or short to be loving and kind. I don’t want to fight him and push him beyond what he feels capable of all day long. It’s too hard. He wouldn’t succeed in a different setting anyway, so why do I beat myself up when he’s struggling to learn with me? I do want to instill a love of learning and reading. He already has that, but is struggling to find anything he enjoys now. I would prefer a no tv and no games type of household, but I do recognize that it is a powerful distraction, and that he needs that distraction to survive for now. If that means he doesn’t graduate from high school – fine. If it means brain surgery – fine. Any way you look at our lives I don’t have a lot of time with him left. This illness and the ones they suspect he has end in death for some. Surgery is also very dangerous and some do not survive the surgery, or have complications following surgery that lead to death or permanent disability. If all that is avoided, he will still grow up and leave home eventually. I expect he will get through this. I try not to expect the worst or even think of the bad possibilities. There is a lot between great and healthy, and sick and possibly dead. On my worst nights I fear the worst, but most of the time I hope the doctors can find a way to help him without surgery and I expect all will be well. We may need to repeat eighth grade, but that’s not that bad. He may exceed expectations and graduate early once we resolve some of this. It’s just a matter of finding our way through day by day and remembering what is most important. I love my son, and I will do anything I can to help him. «Solo – A Star Wars Story – It’s a great story!